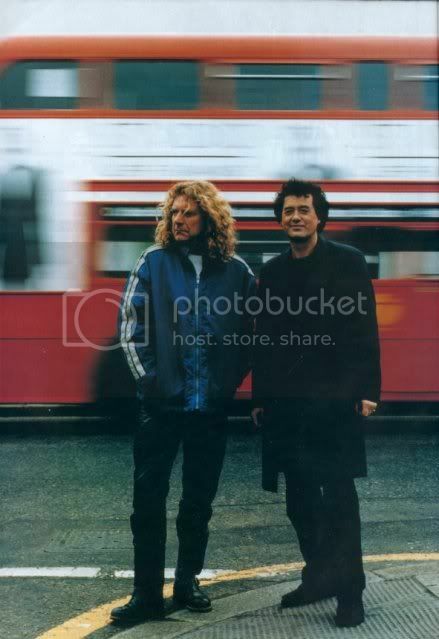 I wanna know Jimmy Page's shoe size! I agree Jimmy is 5' 11" to 6' tall with Robert between 6' and 6' 1". From what I've heard over the years I have to agree with Steve regarding how tall Jimmy and Robert are. According to a bio written up in the '60's for the band Listen Robert's height is listed at 5ft. 11.5 inches tall. Of course this same bio states Robert's birthday on August 15th and that he plays the flute. One thing that stands out to me is not so much Jimmy's height, but the wingspan of his arms! Seriously, take a close look of pictures him playing his Les Paul and how low he plays the darn thing! His arms look unusually long! Kinda freakish! All people lose a little bit of height during their life span, the spine is constantly crashing in on itself every day. Yeah, it's great. I'm gonna be a super-shrimp! No, they didn't and they don't. just out of curiosity, what kind of shoes did they wear when they did a concert? If you look at concert shots of them, they have shoes that were in style in the 70s. With The Yardbirds, Jimmy often wore what are called "Beetle boots". I think Jimmy's most well-known footware from the Zep era are those black and white shoes he wore on the '73 tour, if only on account of the film TSRTS. When he toured with The Firm in the mid 80's he favored knee-high black leather boots during the initial winter gigs before switching to white sneakers and Hawaiian shirts for the summer of '85. the concerts they performed. Do I win a prize? No. Do you mean "Beatle boots"--meaning boots with Cuban heels? Jimmy isn't that tall. I remember the last Page/Plant tour ten years ago, and they put out this promo/ad from Best Buy, the sponsors. There was this picture of Jimmy and Robert standing next to each other, and it looks at first that they're the same height. Then you notice Jimmy's standing on a loading ramp raised at an angle, quite funny, really. I wish I still had a copy of that ad. If anyone has, would you please post it? I was at that St Louis show and the slight delay was over 1.25 hours!!!! from the 60s in almost the exact same pose and surroundings. I guess you mean this one? That's the one. The tour poster uses the same image but adds "Best Buy presents..."
How am I involved in this or are you saying he gets nine lives? They're clearly around the same height. The pavement that Jimmy's on is level with the road. And there's not much of a ramp to it. Judging from this video, I'd say Robert is a bit taller. Yeah, you're right, Robert's got the edge on him there. Which brings us right back around to SAJ's first report that Jimmy is 5'11(ish) and Robert is 6'-6'1(ish). Well, since Jimmy is obviously a lot taller than that--yes.